Healthcare content marketing in its essence is about creating and sharing valuable, relevant, and consistent health-related online materials such as blogs, articles, videos, infographics, and social media posts in order to attract and retain a clearly defined audience – your target patients – and ultimately drive profitable converting actions from them. Content being created and distributed under this marketing approach differ from the usual marketing content like the digital ad copies. That’s because the former content type, unlike the latter one, doesn’t explicitly pitch for products or services, rather provide relevant and useful content to your audience (patients) to help them solve their issues. Oftentimes, they contain a smartly interwoven call-to-action (CTA) for encouraging users to take a desired converting action. The first two points deal with the marketing strategy and the quality of content which help in increasing traffic and patients’ time spent on your website. The lead generation part is associated with the third point. In summary, content marketing has a lot to do with increasing online presence and conversion for your practice. Content marketing can help in increasing your brand’s awareness among your patients. As most (77%, according to Google) of the healthcare inquiries today begin on a search engine, you can create search-friendly and user-friendly content that are relevant and useful to your patients to attract and retain their attention. Regularly publishing educative content and letting them reach your audience through proper networking channels, such as SEO, social media, guest posting, etc., establish credibility for your brand on the web. This improves your chances of getting found by patients every time they search for a related topic. People start recognizing your brand after having interacted with it frequently. Over time, they start giving preference to the contents of your brand (every time they search for a topic). If you keep your content scientifically accurate, valuable, and relevant, you start influencing your prospective patients’ decision making. If your patients start trusting the information your brand is providing, chances are high they’ll consider you as the top priority before booking an appointment, whenever the need arises. Content marketing is one of the most essential components of a robust online presence for your practice. With regular quality content, you can improve your website’s search rankings and overall web reputation. The quality of your content is decided on the basis of two things: relevancy for users, and search engine friendliness. This means that while preparing your content, you should include information that can solve users’ problems, and focus on including the most relevant keywords and relevant links (to relevant blogs and reports with deeper study material on the topic) to make it easy for search engines to find it in the first place. Also, with Google ready to launch its mobile-first index, you must also optimize your content (text, images, or videos) for mobile-friendliness. Optimizing your content for mobile-viewing makes it more search-friendly and helps you rank even better as almost 60% (and growing) of patients now use mobile devices for healthcare inquiries, according to Google. Read about the important qualities of a mobile-optimized content. Note: Mobile-first index means that your overall search ranking on any device (desktop or mobile devices) will be decided by your performance on mobile devices. The biggest benefit content marketing provides is helping you build a group of patients on whom your brand has a good influence. These patients who keep taking reference from your site’s content on a regular basis for finding solutions, create an affinity and trust for your brand. The more your content will have an influence on patients, the more they’ll talk about it, and share it with them on social media apps and sites, and keep referring you for any future needs. This group of referring patients can be called your brand advocates. Note: increased liking and sharing of your content boost your search rankings too. Whatever that improves your search rankings, improves your website’s chances of being viewed too. Also, a higher regular visit for your website also improves the chances of conversion for you. Check if your content contains words like ‘complex’, ‘state-of-the-art’, ‘advanced’, and ‘world class’. Avoid them, as they don’t mean anything to your patients. With almost 80% of patients using search engines for healthcare inquiries, you should know who among them are your target audience. The best way to know that is to include information on all services you offer. Meanwhile, don’t forget to optimize your content with service relevant keywords. Done properly, this will automatically tell the search engine to guide your relevant audience towards your site. 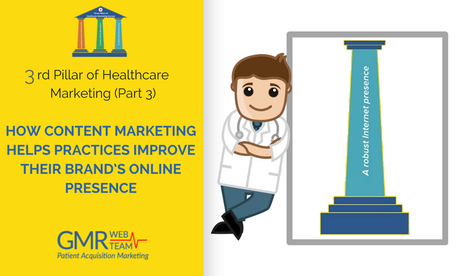 It’s your content with which your patients engage in a conversation, and which has the power to persuade them to take a desired profitable action. Everything else, like the design of your website, or its functions can only work for facilitating the process for you and your patients. Develop a strong content marketing strategy that can drive more patient engagement. It’s only by engaging your patients for longer on your website that you can buy more time for them to interact and make a decision to choose your practice.